The Chuvash people (/tʃʊˈvɑːʃ/; Chuvash: чăваш, IPA: [t͡ɕəˈʋaʂ], plural: чăвашсем, singular: чăваш; Russian: чуваши, pronounced [t͡ɕʊˈvaʂɨ]) are a Turkic ethnic group, native to an area stretching from the Volga Region to Siberia. 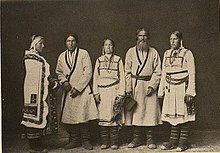 Most of them live in the Republic of Chuvashia and surrounding areas, although Chuvash communities may be found throughout the Russian Federation. Distribution of Chuvash in the broader Volga-Ural region. Source: 2010 Russian Census. The Turkic ancestors of the Chuvash people are believed to have come from central Siberia, where they lived in the Irtysh basin (between the Tian Shan and Altay) from at least the end of the third millennium BC. In the beginning of the first century AD, the Bulgars started moving west through Zhetysu and the steppes of modern-day Kazakhstan, reaching the North Caucasus in 2nd–3rd centuries AD. There they established several states (Old Bulgaria on the Black Sea coast and the Suar Duchy in modern-day Dagestan). Old Bulgaria broke up in the second half of the 7th century, after a series of successful Khazar invasions. Some of its population fled north, to the Volga-Kama region, where they established Volga Bulgaria, which eventually became extremely wealthy: its capital being the fourth-largest city in the world. Shortly after that, the Suvar Duchy was forced to become a vassal state of Khazaria. About half a century later, the Suvars took part in the Arab–Khazar wars of 732–737. Today Chuvash people are Eastern Orthodox Christians and belong to the Russian Orthodox Church. They retain some pre-Christian Tengrism traditions in their cultural activities. They syncretized Orthodox Christianity and Tengriism. Parallel pray in the shrines called keremet and sacrifice geese there. One of the main shrines is located in the town of Bilyarsk. Chuvash woman from Ulyanovsk Oblast, mid-to-late 19th century. Married Chuvash woman in costume of matchmake. There are rival schools of thought on the origin of the Chuvash people. One is that they originated from a mixing between the Turkic Sabir tribes of Volga Bulgaria and, according to some researches, local Finno-Ugric tribes. Earlier genetic research using autosomal DNA markers suggested a Finno-Ugric origin for the Chuvash. This study examines non-recombining DNA markers to better elucidate their origins. The majority of individuals in this sample exhibit the maternal haplogroups H (31%), U (22%), and K (11%), all representative of western and northern Europeans, but absent in Altaic or Mongolian populations. Multidimensional scaling (MDS) was used to examine distances between the Chuvash and 8 reference populations compiled from the literature. Mismatch analysis showed a unimodal distribution. Along with neutrality tests (Tajima's D (−1.43365) p < 0.05, Fu's FS (−25.50518) p < 0.001), the mismatch distribution is suggestive of an expanding population. These tests suggest that the Chuvash are not directly related to the Turkic and Mongolic people along their maternal line but supports the hypothesis that their language was imposed by a conquering group—leaving Chuvash mtDNA largely of European origin with a small amount of Central Asian gene flow. Their maternal markers appear to most closely resemble Slavic and Finno-Ugric speakers rather than fellow Turkic speakers. The MtDNA gene pool was found to be 89.1% Caucasoid, 9.1% Mongoloid and 1.8% unidentified. According to autosomal analyses, the present-day Chuvash speak a Turkic language but are genetically a mix of East-Asian and European elements. They are generally closer to Europeans with some genetic input from Siberia. An autosomal analysis (2015) detected an indication of Oghur and possibly Bulgar ancestry in modern Chuvash. These Oghur and Bulgar tribes brought the Chuvash language with them. Another study found some Finno-Ugric components in Chuvash people. Portrait of Chuvashes during a festival. Chuvashes at the court with traditional dress. ^ "Демоскоп Weekly - Приложение. Справочник статистических показателей". Demoscope.ru. 2013-03-21. Archived from the original on 2011-06-04. Retrieved 2016-02-09. ^ "Всеукраїнський перепис населення 2001 - English version - Results - Nationality and citizenship - The distribution of the population by nationality and mother tongue - Selection". 2001.ukrcensus.gov.ua. ^ "Демоскоп Weekly - Приложение. Справочник статистических показателей". Demoscope.ru. 2013-03-21. Archived from the original on 2012-03-14. Retrieved 2016-02-09. ^ "НАЦИОНАЛЬНЫЙ СОСТАВ НАСЕЛЕНИЯ РЕСПУБЛИКИ БЕЛАРУСЬ (ETHNIC COMPOSITION OF POPULATION OF THE REPUBLIC OF BELARUS)". Archived from the original on February 7, 2009. Retrieved October 21, 2009. ^ "Демоскоп Weekly - Приложение. Справочник статистических показателей". Demoscope.ru. 2013-03-21. Archived from the original on 2016-01-25. Retrieved 2016-02-09. ^ "Демографические тенденции, формирование наций и межэтнические отношения в Киргизии". Demoscope.ru. Archived from the original on 2016-02-06. Retrieved 2016-02-09. ^ "Демоскоп Weekly - Приложение. Справочник статистических показателей". Demoscope.ru. 2013-03-21. Retrieved 2016-02-09. ^ "Демоскоп Weekly - Приложение. Справочник статистических показателей". Demoscope.ru. 2013-03-21. Archived from the original on 2011-08-26. Retrieved 2016-02-09. ^ "RAHVASTIK RAHVUSE, SOO JA ELUKOHA JÄRGI, 31. DETSEMBER 2011". pub.stat.ee. ^ Gerard Clauson, Studies in Turkic and Mongolic Linguistics. Routledge, 2002, p. 23. ^ ""Haval" somera tendaro 2015 | Чувашская общественная организация "Хавал"". Cv-haval.org (in Russian). Retrieved 2016-02-09. ^ Orion M. Graf, John Mitchell, Stephen Wilcox, Gregory Livshits, and Michael H. Crawford. Chuvash origins: Evidence from mtDNA Markers. (2010) "Their maternal markers appear to most closely resemble Finno-Ugric speakers rather than fellow Turkic speakers." ^ a b c John R. Krueger, Chuvash Manual. Introduction, Grammar, Reader, and Vocabulary (Hague, 1961), 7–8. ^ Chisholm, Hugh, ed. (1911). "Chuvashes" . Encyclopædia Britannica. 6 (11th ed.). Cambridge University Press. p. 350. ^ "European Journal of Human Genetics – Supplementary Information for article: The phylogenetic and geographic structure of Y-chromosome haplogroup R1a". Naturecom. 23. ^ S. A. Fedorova; M. A. Bermisheva; R. Villems; N. R. Maksimova; E. K. Khusnutdinova. "Analysis of Mitochondrial DNA Lineages in Yakuts" (PDF). Evolutsioon.ut.ee. Retrieved 9 January 2018. ^ Arnaiz-Villena, Antonio; Martinez-Laso, Jorge; Moscoso, Juan; Livshits, Gregory; Zamora, Jorge; Gomez-Casado, Eduardo; Silvera-Redondo, Carlos; Melvin, Kristin; Crawford, Michael H. (1 June 2003). "HLA Genes in the Chuvashian Population from European Russia: Admixture of Central European and Mediterranean Populations" (PDF). Human Biology. 75 (3): 375–392. doi:10.1353/hub.2003.0040. hdl:1808/13584. ISSN 1534-6617. PMID 14527201. ^ Yunusbayev, Bayazit; Metspalu, Mait; Metspalu, Ene; Valeev, Albert; Litvinov, Sergei; Valiev, Ruslan; Akhmetova, Vita; Balanovska, Elena; Balanovsky, Oleg; Turdikulova, Shahlo; Dalimova, Dilbar; Nymadawa, Pagbajabyn; Bahmanimehr, Ardeshir; Sahakyan, Hovhannes; Tambets, Kristiina; Fedorova, Sardana; Barashkov, Nikolay; Khidiyatova, Irina; Mihailov, Evelin; Khusainova, Rita; Damba, Larisa; Derenko, Miroslava; Malyarchuk, Boris; Osipova, Ludmila; Voevoda, Mikhail; Yepiskoposyan, Levon; Kivisild, Toomas; Khusnutdinova, Elza; Villems, Richard (21 April 2015). "The Genetic Legacy of the Expansion of Turkic-Speaking Nomads across Eurasia". PLOS Genet. 11 (4): e1005068. doi:10.1371/journal.pgen.1005068. ISSN 1553-7404. PMC 4405460. PMID 25898006. Kumyks are a Turkic people living in the Kumyk plateau, the lands bordering the Caspian Sea, Northern Ossetia, Chechnya and the banks of the Terek river. They speak the Kumyk language, which until the 1930s had been the lingua-franca of the Northern Caucasus. Serbian diaspora refers to Serbian emigrant communities in the diaspora. The existence of a numerous diaspora of Serbian nationals are mainly consequences of either economic or political reasons. 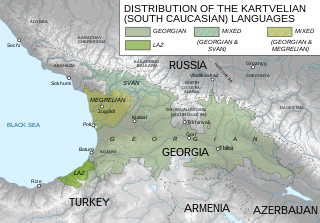 The Svans are an ethnic subgroup of the Georgians (Kartvelians) living mostly in Svaneti, a region in northwest Georgia. They speak the Svan language and are mostly bilingual also in Georgian. Both these languages belong to the Kartvelian language family. In the pre-1930 Soviet census, the Svans were afforded their own "ethnic group" (natsional'nost) category. The self-designation of the Svan is Mushüan, which is probably reflected in the ethnonym Misimian of the Classical authors. Preobrazheniye is an urban locality in Lazovsky District of Primorsky Krai, Russia, located on the Preobrazheniye Bay of the Sea of Japan. Population: 7,184 (2010 Census); 9,335 (2002 Census); 12,213 (1989 Census). Turgai was an oblast (province) in Imperial Russia, established on October 21, 1868. It was located in the central part of present-day Kazakhstan. The Batum Oblast was an oblast (province) of the Caucasus Viceroyalty of the Russian Empire, with the maritime city of Batum as its center. It roughly corresponded to most of present-day southwestern Georgia. It was created out of the territories of the former Ottoman Sanjak of Batum. The Zakatal Okrug was an okrug (district) of the Tiflis Governorate of the Caucasus Viceroyalty of the Russian Empire. It roughly corresponded to most of present-day Balakan, Zaqatala and Qax regions in Azerbaijan. It was created out of the territories of the former Free Jamaats of Jar-Balakan and had a special status of a military administrative unit. The Soviet Census conducted in January 1970 was the first census held in Soviet Union (USSR) in eleven years. Salar is a town in Tashkent Region, Uzbekistan. The town population in 1989 year 25,521 people. The Sukhum Okrug was an okrug (district) of the Kutais Governorate of the Caucasus Viceroyalty of the Russian Empire. It roughly corresponded to most of present-day Abkhazia.